We have been designing the Legacy bedframe for over two years using decades of combined knowledge to build the ultimate bed base. Your bed frame and mattress base are not just a functional surface for your mattress but also an important part of your bedroom interior design aesthetic and we believe we have married the two perfectly. Our aim was to create a bed base where every detail had been designed with the highest quality materials in mind. The sky was the limit. Every function and aspect of the bed frame was redesigned to make it as seamless as possible. We didn’t just want the base to look nice from a distance, we wanted it to feel incredible and be irresistible to touch. 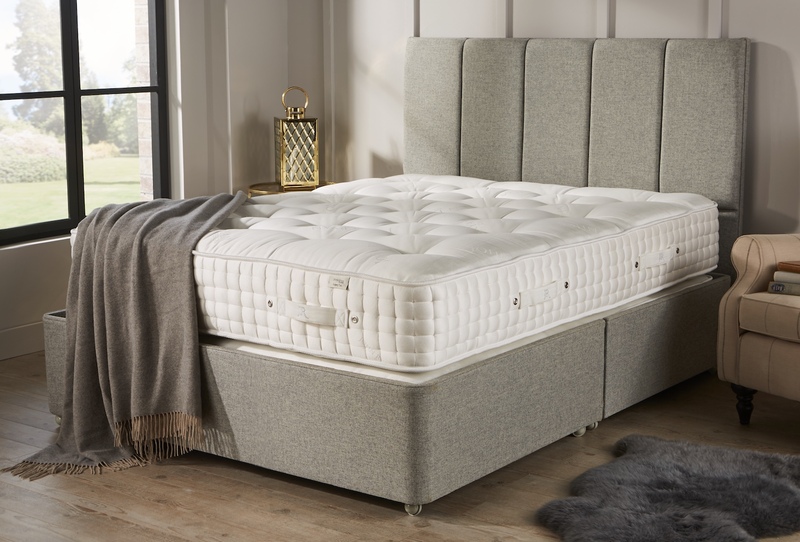 By choosing only Natural British Fibres to upholster the handmade wooden base we have strived to create the most decadent sleep experience possible. By using our own careful blend of English Heritage wool fibres, dyed and woven just for us, we have created a simply beautiful bed frame for those where only the finest materials will do. The wool is soft and smooth giving the bed base a really comforting feeling. The frame of the Legacy mattress is made out of FSC (Forestry Stewardship Council) assured timber which is then handmade by craftsmen. The frame is jointed not screwed and there is zero MDF or corners cut when making the Legacy base frame. The wood has been pressure treated to stop it from warping and it is carefully dried out to prevent shrinkage. Then our craftsmen hand make the base frame in its entirety, no imported frames or materials are used. The Legacy Bedstead is a one of a kind featuring a recessed base spring unit. It houses 1300 1.6 gauge vanadium coated calico pocket springs. These springs are made in Yorkshire for us for this specific unit. They are set within the hand-made wooden frame and then upholstered with a 1200 GSM English Swaledale wool from Edward Clay and then finished with the finest 1200 GSM of Luxury Cashmere for that softer breathable top layer. Giving the most progressive of mattress support experiences. Why recess a mattress base? We have chosen to recess the mattress base to help reduce the overall height of the John Ryan Legacy. 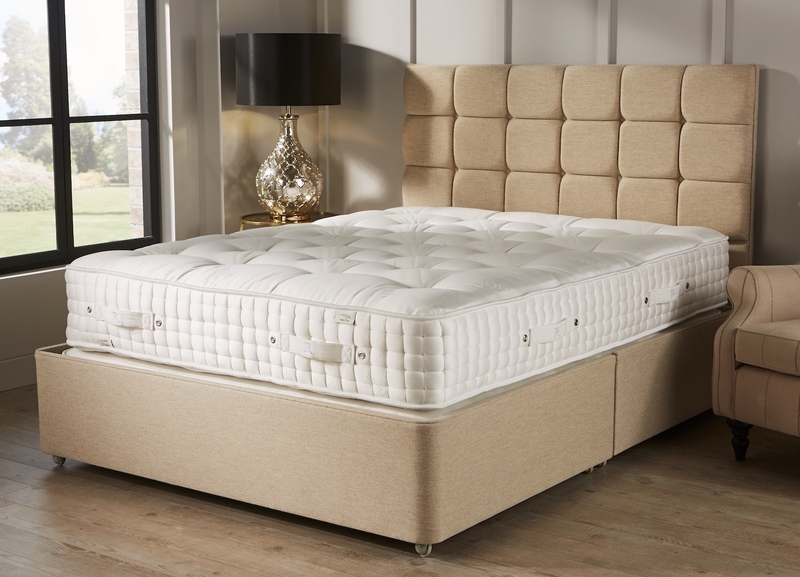 With high-end natural fibre mattresses, height can become an issue due to all the fillings within them. This unit in its entirety utilises a total of 16,800 GSM of pure Natural fibres for the upholstery. The upholstery fibres in the Legacy are predominantly British keeping the carbon footprint as low as possible. In the past, we have had to balance comfort with the practicality of the overall mattress height. However, with the Legacy, we didn’t want to be constrained by the height so have created a recessed mattress base. This means that we can fit even more natural fibres into your Legacy mattress without it becoming overwhelming high. See we really have thought of everything. Which is why we believe this to be the best-upholstered bed without comparison ensuring that we can truly describe this bed as the best in the world. Not happy with a just having a recessed base spring unit we wanted to also include a first of a kind mattress base pad in the Legacy. John has been working on a base pad prototype for years and has been meticulous in working out the perfect ratio of fibres to springs. All without the pad competing with the main mattress or sprung edge base. We have finally been able to use the ideal materials for our new feature. The base pad acts as another layer of progressive support between the bed-frame and the upper mattresses. By incorporating this we can further extend the support and subtle reactivity of the mattress. This really is the kind of princess and the pea style design so even the lightest of sleepers will be perfectly supported even for tiny adjustments during the night. 1000 GSM of Alpaca fleece. The mattress base pad also helps extend the longevity of both the Legacy sprung edge base and mattress. Meaning that you can sleep safely in the knowledge that not only do you have the world’s most progressive mattress but probably the world’s most long-lasting luxury mattress as well. Our wool covering for the John Ryan Legacy has been designed in-house in conjunction with Mitchel Interflex. Using carefully chosen 100% English wool which is sheered, cleaned and dyed here in the North of England the end result is stunning. We have worked diligently with Mitchel Interflex to create the most luxurious wool fabric that is incredibly soft to the touch whilst being extremely hardwearing. No detail has been spared in creating this gorgeous natural UK sourced and woven fabric. We have hand selected colour threads to create our two signature colours. These are our signature Legacy mattress colours. These colours will complement both a contemporary or traditional room aesthetic as the soft blend tones of each colour palette carefully accentuate the fabric. 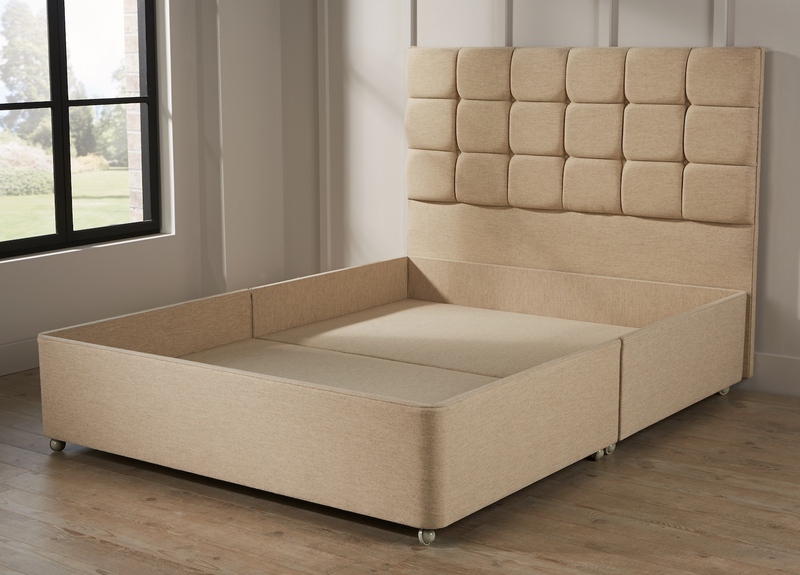 Linking bars are an important feature of sprung edge mattress base design. They keep the two halves neatly together, allow ease of movement if you need to split a zip and link or moving your bedroom furniture around. However, for the style conscious, wouldn’t it be nice to be able to hide these bars and have a continuous run of beautiful natural wool upholstery that doesn’t have the distractions of a linking bar? With this in mind, we introduce the ‘Tooth-lock’ system in this bespoke bed base. This system uses metal teeth hidden under the base to lock the two parts together securely and without the fuss of a visible linking bar. A quick push of the switch underneath and you can then separate the bases if you wish. Leaving you with a seamless mattress base which blends into a room effortlessly. The devils in the detail and the feet which bed bases sit on are no exception. Not all castors are made the same, with cheap imports breaking more often than not or squeaky and coming loose. We have sourced British Castors from Kendricks made to our exacting technical specifications. These castors are of the highest quality. These solid metal castors are made here in Britain at their factory in West Bromwich. Archibald Kenrick & Sons started life as an iron founder in 1791, making livery and buckle fastenings. They have since moved on to develop their products range to include their infamous shepherd castors and bed feet fittings. Rather than the cheaper pressed socket and arm fixings we only use the screw thread grommet and screw arm fixing. These are far superior and allow removal of the castors easily if needed, whereas the cheaper manufacture method means that once removed the grommets are irreparably damaged. We believe this small detail completely finishes off our Legacy mattress base. If you prefer glides we also can supply this model with contemporary steel glides instead. What are the sizes of the Legacy sleep system? The Legacy follows the standard mattress sizing conventions found here so that you can use standard extra deep fitted sheets. However, the base is slightly larger than standard sizes to accommodate the base pad and mattress. Please see below for the sizes and be aware that all furniture sizes are subject to a 2cm tolerance. Please give us a call if you wish to discuss access requirements. The Legacy sprung edge base and base pad are one of a kind. We are using the latest innovative technology with the tooth lock system to ensure zero movements from your base when joined together. 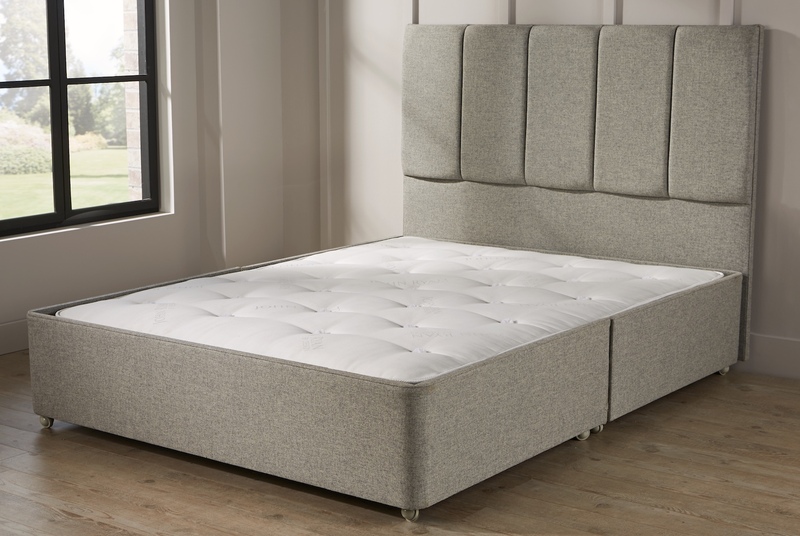 The recessed base allows us to finally launch our one of kind base pad, which increases progressive comfort and the lifespan of your mattress. 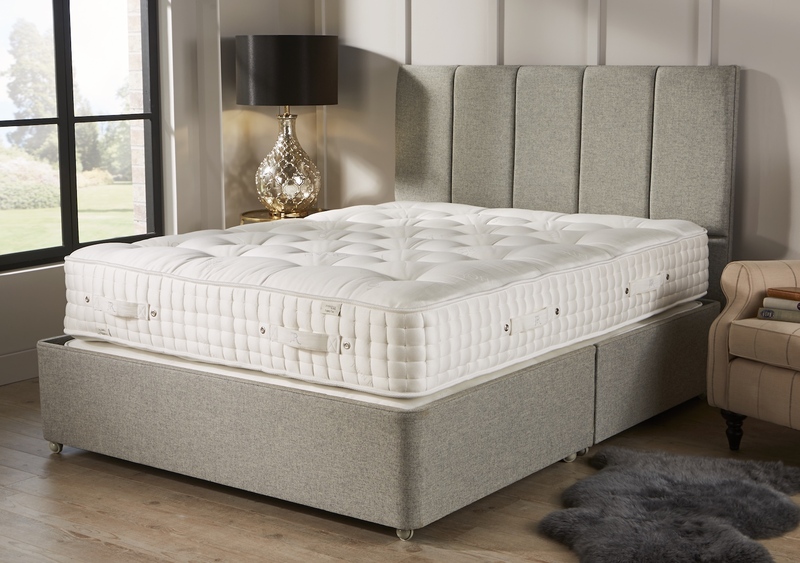 Finally, we have created the most superior 100% British wool cover to give you a smooth elegant finish to the base and headboard. Why not speak to our team on 0161 437 4419 about what we believe is probably the world’s finest mattress?